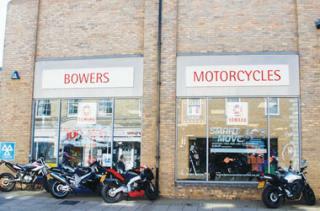 On Saturday 18th February Bowers Motorcycles, on Risbygate street, will be hosting their open day between 8.30am and 5.00pm. They will have lots of offers and activities on the day with a special guest appearance from Tommy Hill. Bowers are one of the UK's leading Yamaha Motorcycle dealers and they will be offering special offers and discounts throughout the shop on the day. Special guest Tommy Hill is the winner of the British Super Bike Championship from 2011 and rides for Yamaha, he will be at the shop between 11.00am and 2.30pm on the 18th. The open day will also include a free prize draw, showcasing of Bowers new lines for 2012, and a chance to have a picture taken with Yamaha's Jorge Lorenzo's race suit. So pop down to Bowers on the 18th February and have a look.